Ostrzeszów is a relatively large town of the Greater Poland Province, so there should not be any problems with its finding. Being in Ostrzeszów you have to make along the road no 449 for Błaszki. That way you reach the center, where on the right side of the road, in a distance the tower of the castle is visible. Ostrzeszów for the first time appeared in sources in 1283 as Schildberg and Siltperch. 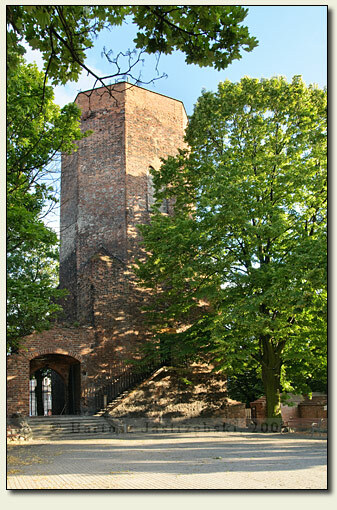 Jan from Czarnków as well as other sources ascribe an erection of the stronghold to Kazimierz Wielki. The castle was being successfully used until the time of the Swedish wars, after which it was demolished. However, it was quickly rebuilt, and in the later years it saw its conversion too. However, already at the end of the XVIIIth cent. it deteriorated again, and in the consecutive century the castle was partly dismantled. The remains of the building were secured after the World War II.